The file is marked read-only. Individual files can be marked as being read-only - typically as a means to protect them from being overwritten. The file is on a media that is read-only. CD-R's are write-once media. Once a CD-R has been burned, it cannot be written to - it can only be read. Hence the files on it are marked as "read-only". The file is in use. Less frequently, another program might have the file open in such a way that anyone can read it, but the file is locked for writing. In some cases this can be reported as the file being "read-only". Let's look at what we can do about each of those. If a file is marked as read-only on the disk, it's fairly easy to reset that attribute. Note the Attribute setting "Read Only" - uncheck it if it's checked, and press OK. If no error appears, the setting has been removed. "When you copy a file from a read-only media such as a CD-R, the read-only status is copied with it." If the file is on a read-only media like a CD-R or a read-only network share, you cannot change the read-only status. In this situation, or if you just want to avoid changing the read-only status of the file as we just did, the next best solution is to make a copy of the file onto your local hard disk. So, using Windows Explorer, the command prompt, or whatever means you use to copy files, copy the file or files from the read-only media to a folder on your hard disk. Important! When you copy a file from a read-only media such as a CD-R, the read-only status is copied with it. That means you still can't write to the file until you take the steps above to reset the read-only attribute on the file on your hard disk. This causes people no end of confusion. Finally, if the file is in use, you again, can either make a copy of it, or determine who's using the file and close that program. While the question asks specifically about Excel, in fact the most common scenario where this whole read-only problem comes up is when email folders are copied to CD-R for backup or for moving to a different machine. "After copying files from CD-R you still must reset the read-only attribute if you want to be able to write to them. Mail programs, particularly Outlook and Outlook Express, expect - and require - that they be able to write to the files containing email. If these files are marked read-only then the program will either fail to open them, or worse, tell you that they don't exist. And remember - copying the files to your local hard disk isn't enough. I see people frequently stymied because they've copied their files locally thinking that was enough, and they still can't open their mail. After copying files from CD-R you still must reset the read-only attribute if you want to be able to write to them. And naturally that holds true for the Excel file we started with. Copy the file to your hard disk, reset the read-only attribute, and you should be good to go. I am not sure if excel does this but files can be "in use" if there is a locked file present. If a program crashed and did not clean up its locked file (.ldb in Access) the program thinks that the file is being used. Simply deleting the lock file can also solve the problem. For unlocking of locked files, I recommend Unlocker (http://ccollomb.free.fr/unlocker/), it makes this annoying job very easy. Additionally, if you have a file or directory you can't open at all (e.g. when no user has the right to access the file... I had that problem before), you could try to use a Knoppix-DVD to boot the system and access the files (e.g. copying it to an external medium). this is raghvendr shastri. i am very thankfull for you to send me these tips. please tell me how can i read your old articals? Thank you('Amesegnalehu') Leo, how do I access(read) your old articles? I was pleasantly surprised when I got all my old emails back thanks to your tips. Is there any way for me to get back that *.iaf file too? I'm pretty hazy on what my account settings used to be. After trying to open a Word attachment from an email I�m getting an error saying that the file does not exist on Word, Excel and Porwerpoint (at least!). I cannot open any of my previous documents. They are not read-only. In word a message appears about the Normal template. I have renamed the template, saved it under a different name and the problem persists. What is going on? When backing up Quicken files onto CD-R or CD-RW, I try to restore per Quicken. The files are visible, but will not open "Cannot open the data file because it is read-only". The "Properties" method above does not help. I restore backup according to both Quicken & also using RecordNow burning program methods. Hi Have a Problem. my computer fried recently total mother board failure. I brought out the old 300mhz pIII and put my Hard drive from the old computer in an external HD Box and was hoping to be able to access the Drive. I can write and read the drive but I can not get into my documents under what used to be the the old administrator Name. I can look at anything on the drive except the documents under the old Amin name. This is where all my stuff is and I cant figure out how to get at it. I have tried copying " your not authorized to access", Ive tried setting the logon name to be identicle to what used to be on the old computer. Ive tried to make the files available for sharing. nothing works so far. How can I get at these files? on my old drive. When I attempt to open an excel document by clicking on the document's icon. This in turn opens excel as expected. However, that is all that happens. Clicking on any excel document icon only opens excel and NOT the document. I have to open an excel document directly from excel in order for it to open. How can I fix this without having to reinstall Excel? Or am I left with no other choice? I get taken back to the screen with all the icons. Can't seem to open any of the files that are attached to that subject. Please help. Setting up your own tip ar is easy. Heck, just do a view-source on http://buyleoalatte.com and that's all there is. Frontpage extensions are evil :-). I never use them - they result in non-standard web pages, and often very convoluted HTML. I strongly recommend that you find alternate ways of doing whatever it was you were relying on FrontPage extensions for. I faced exactly the same problem with excel files while opening from a CD-R. However even when I try to copy the file(s) to my hard drive it gives error message - Cannot copy :Cannot copy from source or disk. I tried with other type of files like pdf, doc and they too are giving the same problem. When you copy a file from a CD-R, the "read only" attribute is copied with it. Clear that in Windows Explorer, and you should be able to edit the file. I'm having problems opening my excel file. Everytime I open my excel file, it launches the installation of microsoft office xp professional with frontpage. Now I can't open my excel file at all. Do I need to install microsoft office professional with frontpage? My excel was working fine previosly. the file on desktop cannot be opened on clicking, it just opens a blank window.... but if I then go to Open folder/files and then to desktop file..it is accessble. So what do you suggest me to open my files just by a double click? I use Windows XP Media Center Edition, Internet Explorer 7 and Outlook Express 6. A week ago I copied all Outlook Express messages from the Store folder to a backup folder on my C: drive. I then WinZipped all the messages and burned them to a CD-RW. Two days ago I unzipped and extracted all .dbx folders from the CD-RW back to my C: drive backup folder. In Windows Explorer I can clearly see all the .dbx folders in my backup folder. I checked their properties: they are not read-only files. I used the correct Outlook Express import routine but the import wizard tells me it can find no messages. I then opened the Store folder in Windows Explorer and dragged a few .dbx files from my backup folder to the Store folder. However, when I open Outlook Express the dragged .dbx files do not show up. I then tried changing the "Open with ..." properties of one .dbx folder, going through the first three listed programs: Internet Explorer, Word, Excel. No luck. Tnen I navigated through "Open with ..." and selected Outlook Express. The icon of all the .dbx folders changed in each case, but none of this helped to open the backup .dbx folders in Outlook Express. Then I opened the Outlook Express program folder and selected oeimport.dll. Now my Store folder displays all the .dbx folders with the pretty red-and-blue icon, but I still can't open the restored .dbx folders in OE although they do appear in the Store folder with the all the rest. I can't think of anything else. Can you tell me if I should change the "Open with ..." properties to some other .exe or .dll program, or is that of no use? Any other ideas? Thanks a lot. I downloaded some photographs onto a CD-R 700mb disc a few weeks ago. Im now looking for the disc but I didnt mark it, I have a CD-R disc that is full and I think Its the one I need. However it will not open up so I can look whats on it. It doesn't tell me anything if Its a read only file or whatever It just fails to open. I have tried opening it with different systems and nothing, can you suggest anything. Hi. I've followed all the instructions for importing my Outlook Express files from my old laptop to my new one but am still having trouble. The files are on a CD-R. I copied them to my hard drive, then un marked 'read-only' under properties. It allows me to do that but then it just changes itself back. Can you help at all? I just got a new machine and upgraded to Vista and Microsoft Office 2007. I send out these Excel files to my buddies and none of them can open the files. What do they need to do? Thanks. If they don't have excel ... get excel or openoffice. backwards compatible file format before sending. That might be easiest. Hi Leo...I've followed your instructions for copying my folders from my Outlook Express file on my old computer to a CD without any trouble, have saved them to the hard drive on my new computer, have unchecked the Read-only box in properties but I still can't read my messages in Outlook Express...they were all in dbx files so I changed them to Excel files but still cannot read them. What am I doing wrong please? Also how do I change them back to dbx files please? Hi Leo-- I read the article above. But all 1900 of my documents transferred off of the CD into "My Documents" in "Read-Only" status. By the why I used CD-RW discs when I did the transfer. The steps I followed are below. Is there a way I change all of my documents at one time so that I can un-do the "read only" status? 1. I put the CD in the new machine. 2 I clicked on "Explore" from the Start Menu so I could get to "My Computer"
3. I clicked on "My Computer" which opened up the window for my "D-Drive" (my CD drive). 4. 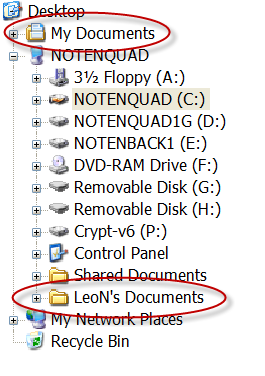 I did Control-A and selected all of the documents in the "D" folder. 5. I right-clicked inside of that folder (can't remember if the cursor was on a Document icon or on the space in between the docs). 6 After I right -clicked, I scrolled down to "Send To" and selected "My Documents"
7. When I went into My Documents, all of my documents were there. However when you open any of the documents, in parentheses at the top next to the name of the file it says "Read-Only". I have some files saved on a jump/flash/thumb drive (whatever you want to call it)...they worked fine until yesterday. I tried opening excel and word files and I keep getting the error "the file may be read-only, or you may be trying to access a read-only location. Or, the server the document is stored on may not be responding." How can I fix this? I have some files saved on a jump/flash/thumb drive (whatever you want to call it)...they worked fine until yesterday. I tried opening excel and word files and I keep getting the error "the file may be read-only, or you may be trying to access a read-only location. Or, the server the document is stored on may not be responding." How can I fix this? When I open the files properties none of them have the read-only box checked. Thanks for all this. However, what if 1) it's a rewritable disc 2) the system won't allow me to uncheck "read only?" This is an internal drive; all worked well until today; now all discs are, Stalinistically, "read only," no matter what I try? The disc drive is broken? Hi I have a excel file in the share drive , several users use it, suddenly every one is getting this error message this error message "*.xls cannot be accessed. 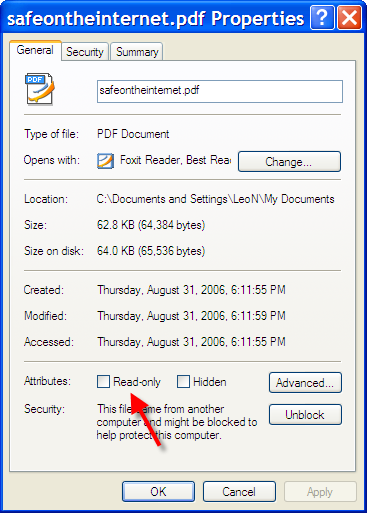 The file may be read-only, or you may be trying to access a read-only location. Or, the server the document is stored on may not be responding, , I tried your method but when I tried to find /Handle it dont display any files, I need to know who is the culprit as this is very important file, I have restored the back up copy and tried to delete the old file, still gives me the same error,My file in on a shared drive, how do I apply the .exe on my share drive ?? i dint get this part, I am not that strong technically, but at the same time I have to fix this ASAP, Any help?? why my vista business edition cant open a "application.exe file".once my cursor point just to the .exe file folder my system hangs.just pointing no action being done yet.i noticed that exe file in vista home edtion,the icon is different compare to my business edt.how can i solve this.the file is a game file around 500mb.counter strike source.exe.kindly email me. I have read the comments above but been unable to find the answer to my problem. I did a wipe of my computer last week but before that I had been backing up (or thought I had) my pst file for Outlook 2003. Now when I try to reload my backed up pst file it always asks for a password but I never gave it one. Going into the properties of the new pst file that Outlook made when it reloaded it gives the option of changing the password but I can't as I don't have the original password. How do I set it up so that I can create the first password or find out what the original was. After I transferred the Outlook Express, every file comes up as 'DBX' and can't be opened. What can I do about this? Why can't open properties in "My Computer"
Some flash drives have a physical read/only switch on them, perhaps that got tripped? If not, I'd copy the documents off of that flash drive asap, as I'd be worried that it's about to die. hi, i saved several word files in my documents and was able to open them , but now i cant open them as it says they are not supported. Not sure what to do. I have a new computer hooked up to a small network at work that can access shared files on a snap server 2200. However, after I open shared documents once, I cannot re-open them from that computer ("file" cannot be accessed. This file may be read-only, or you may be trying to access a read-only location. Or, the server...not responding.). After I logout and log back in again, I can only open the file, but again only once! No other computer has this problem and no one else has opened the shared file. I think something on this new computer is accessing files twice to make them seem read-only when they shouldn't be. Any suggestions? Problem as:"'local travelling.xls' cannot be accessed. The file may be read-only, or you may be trying to access a read-only location. Or, the server the document is stored on may not be responding." I'd tried your method, but problem still. i have no idea. Could you help me to look if i send it to you? Many thks in advance. I followed your instructions for moving OE6 to a new machine. I copied the OE6 to my Documents on the new machine and unchecked the read only but every time I close the wizard the folder reverts to read only. ??? I think I have the same problem as above, but not quite. I made backup CDs of my computer 5yrs ago. I can see all the files with corresponding creation dates and size on the CDs, they have the read only checked, but I can't open or copy/extract any of them from the CDs. Do you have any advice. I've been wondering what to do for years now. Thanks for your time! No way to know what might be happening without knowing exactly what happens when you try to copy the files. I have exactly the same problem as Phil on March 11, 2009, i.e. transfer of mail folders Outlook express ^. Are files read only in express, as I cannot seem to change the properties to enable them to be exported?! RaiseError: The file may be read-only, or another user may have it open. Please save the document with a different name or in a different folder. ===> The file may be read-only, or another user may have it open. Please save the document with a different name or in a different folder. I have saved it as another name and checked the read-only, but still get the message. Any clues would be helpful. Wow, Leo! You saved me hours upon hours of work! Thanks for this article! I went into the file which is a .rar file. I tried to uncheck the read only status and when I applied it came up with 'access denied' I tried to copy the contents into the cd but it comes up with 'incorrect parameter'I tried to fix that problem, but there were no solutions. This CD is from a friend of mine and the majority of the file types are set in .rar. It doesn't let me open it or copy it. Please help. CD-Rs are read-only once they've been created, you can't modify ANYTHING *on* the CD. You need to copy the files to your hard disk, possibly reset the read-only bit, and then you should be able to access or decompress the files. I have the same problem as AMIT. I'm remotely accessing a file. It won't let me open it from its destination, but if I copy it onto the desktop of my home computer, I can then open the file and work with it. The remote disk drive shows up in "My Computer," but when I try to access something through the drive through a program, it doesn't appear. Any thoughts / ideas? Thanks, Mel. I'm trying to open a pdf file from a CD and I keep getting the error message "could not open [file] because it is either not a supported file type or because the file has been damaged". I've been trying to find a solution with no luck. I tried the read only thing you described here and nothing. We are trying to move into the 21st century in our office (!) and currently save files on the old 3" square disks. I need to be able to save files onto CDs, however, I need to be able to open and modify those files/documents from time to time. I realize I can't do that with a CD-R (recordable) disk, but before I invest in rewritable disks, will this solve my problem? Hi! I am an on-line student and my school uses a system called Angel. During this past semester I began to have problems accessing/opening many of the links posted by my professors, most of which were to Word Documents. I know it must have stemmed from me changing or removing something on my computer, but I am yet to figure it out. I even tried a System Restore, obviously with no luck. Do you have any suggestions on how I can fix this? I am completely stumped... Any advice would be greatly appreciated. Thanks! Unfortunately "I began to have problems" doesn't tell me what those problems were, so there's no advice I can offer.